The Elate Clean Cosmetics Twinkle Eye Colours are all about glam! Add some sparkle into your life with these sweet little pots of colour. Use all over the eye, or as a highlight. Dampen your brush and get glimmer cream, or sparkle liquid liner. Fairy is a sweet sparkly peach. Bamboo Stem Extract is rich in minerals and proteins that can restore elasticity and suppleness to the skin. 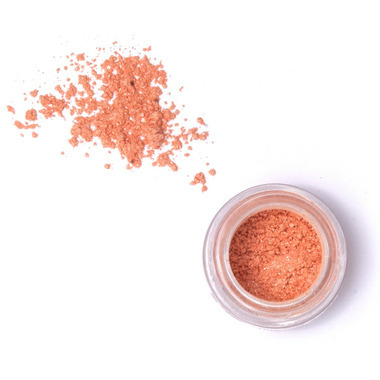 Mica is the shining star of mineral makeup. It is prized for its opalescent sheen, metallic shimmer and iridescence. Naturally occurring, Mica powder is simply a purified and crushed mineral which is mined from the earth. Used as a texturizer, it helps with slip, aids in adhesion and prevents clumping. It’s reflective and refractive properties are what gives mineral makeup the impact, silky texture, and gleam, that we all love so much. Ultramarines are pigments (blue, green, pink, red, and violet). Ingredients: Mica, Iron Oxides, Ultramarines, Bambusa Arundinosa (Bamboo Stem) Extract. May contain Titanium Dioxide.